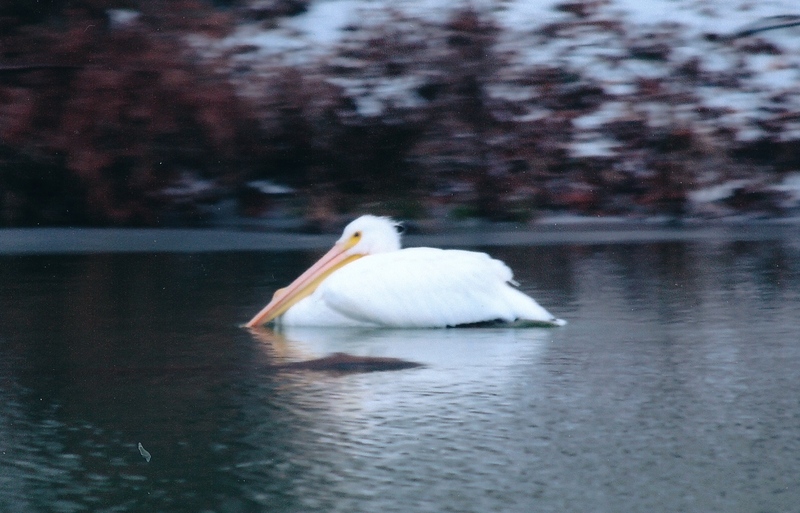 On my parents’ pond, this very rare and extraordinary sighting of a white pelican occurred two days after John’s funeral. A creation whose symbolism reflects John’s character and likeness. It’s been almost eight months since my younger brother transitioned to the place beyond the flesh. I don’t like to use the word death, because he isn’t dead to me, but his soul and the spirit it exudes lives on. The word “passing” is a close second to death, so the word “transition” best fits what I feel to be true of his state. Though, I can’t see him with my physical eyes, my soul feels the closeness of his spirit. It’s like he is in another dimension that sits right up next to this one; a dimension that our physical can’t touch, but our soul can engage. So, I talk to him. I don’t shut down our connection as dead, but keep our connection alive in love and acceptance of how we are today. I tell him I love him. It seems I can’t tell him this enough even though I know he knows it. I tell him how I feel that I let him down in so many ways, yet the moment those thoughts arise I’m reminded of how I have an eternity to make it up to him. Though I feel this way, I sense his spirit has only love for me, and appreciates what I did give; knowing it was the best I could do at any given time; that is John. He is able to see into others. Though I sense he feels the depth of my love, I still wish I loved him better while he was here. And through that desire, I’ve learned many lessons. Though I can see how I could have been a better sister, a better friend, I don’t possess any guilt. It’s not about guilt, but about learning from everything and growing. So, I desire, with great mercy and grace, to live in my increased awareness of all he has taught me and continues to teach me. Though guilt may be an initial reaction to seeing the error of our ways, I’ve learned if I stay in guilt, it keeps me from growing while releasing guilt opens me to learning. Guilt confines me to a reality of a negative effect or outcome, versus growing from my experience and what it intended to give me, and living in that enhanced reality. Because of this, my reflections of John are teaching me a lot. I seek to live in the expanded awareness as I try to carry these lessons forward. I feel this honors him and his transition process. Love never dies. I heard this over and over the week of his transition. To me, it means the connection between us can never end, wherever we are, because it is sown in an intention of pure love. Perhaps my actions weren’t reflective of the love I feel, but I realize that is part of the plight in this brief reality. A pure and true love is the energetic life force of eternity. It can’t die. If it dies, it was something else. So our connection is alive and active. I sense his spirit. Through this interaction, I “see” him more clearly now. I see him in ways I didn’t when he was here. I wish I had this vision while he was here, but thankful to possess it now. For me, continuing to interact with my brother is a blessing to him and me. It isn’t holding on to the past, but engaging him as he is now, and I’ve learned that being current is an essential part of this connection; otherwise I’m connecting to a lifeless image. It’s different in that it’s purely soul to soul, but the connection between us lives. I feel it’s important for him and me that I honor his journey as he moves on to the next stage. Yet, that doesn’t mean letting go of our relationship or connection. But it does mean that I emotionally let him move on to his next stage of his soulful journey by not wanting back the past. Growth, though erratic in going forwards and backwards, comes from a willingness to always go forwards. For John, I sense that for him to feel our active connection is nurturing to him, because I honor his new place. Yes, I miss his presence. But, I want him to prosper and grow in his new environment; whatever that means. So my heart stays connected to him and supports him fully where he is. I think to strongly want back those who have gone through this transition has a negative pull on them. It certainly seems to have one on us. Perhaps if it is negative, then they don’t feel it. But either way, I feel it’s important to set them free in this way, yet continue to lovingly give our support, for their soul lives on. When we have a pure love for someone we emotionally allow them to move forward. If we don’t, there is an unhealthy attachment in the relationship, which is something for us to work through. Because of this understanding of our living connection, I’m exploring a new territory. I’m not only talking to him, but also learning to listen. If our souls are connected because love never dies, then perhaps it’s possible that I can not only sense him, but take it a step further and hear him. With the Spirit of Truth, my soul is like a receiver that picks up a thought impression of his and I record it. I hear the essence of what he is sharing and write it in my words, if that makes sense. Therefore, I use my words to express his thoughts. From this soul connection I’ve experienced with the Spirit of Truth and the many confirmations of this interaction, I’m wondering if this dynamic can occur with John as well; for love never dies, thus the soul connection of that love. Allowing myself to sense John’s presence has brought me to deeper levels of compassion, understanding, and an expanding awareness of the shades of love. So, will I be able to go to this next level? I feel compelled at times to do so, so I follow that prompting. I’m exploring this new connection with the caveat of always desiring to stay in the truth, yet always willing to learn. Regardless, I hold him close. John transitioned, but his soul is very much alive to me. In a pure and true love, our connection remains intact whatever dimension we are in. I let him be free to be where he is. I honor his new form by relating to him as he is. I continue to love him, and with all I’ve learned, more so. I talk to him, I seek to attune to his spirit, and I honor his new life. Love never dies. I take the lessons I am learning from experiencing his life and transition and seek to live in them, which honors him, his life, and ultimately all. Categories: Love, Relationships | Permalink. A friend of mine is going through this. He is experiencing heart-wrenching pain. Thank you for sharing this, Rachel. Thanks Dani. Sometimes seeing a similar situation from someone else’s perspective can help our own. I share my experience for this reason. May you be gifted in comfort for your friend at this time. What a beautiful expression of God through the passing of your brother. You further prove there is only good in all things….for if we look for it… we will find it. Thank you Sonny. When I trust in the divine love of our Creator, which can never fail me; for it is impossible for this love to do so, then I trust that all that happens is serving the highest good. It helps me to see this good in my circumstances, and if I don’t see it at the moment, I know I will once I pass through it. To be honest this thought almost scares me. I have to seek The Lord on it because I wouldn’t want someone to dive into what Saul did by wanting to talk to Samuel from another realm where they were deceased from this earthly realm and received judgement. And The Lord must have forbidden the practice to communicate with the dead for a reason. But we do see an interesting thing happen where it was under the anointing when Jesus was transfigured before the disciples, and Moses and Elijah showed up talking with Jesus who were deceased already. He spoke about his decease and what he would accomplish which is very interesting. Also a man of God once said him and a couple others were seeking The Lord and a man they knew that passed away showed up before them and started teaching them deep things of God. Sounds like this will be an interesting contemplation for you. Certainly there is a lot to consider when diving into this realm. For example, there is a lot unknown about this interaction; thus there is fear around it and as a result a lot of fear has been cultivated around it. But once we’ve established a true relationship with the Spirit of Truth, we realize there is nothing to fear, for we see things more in alignment with Truth. We know our relationship is true with him because an increasing understanding of divine love, our desire to give and receive it, and our overall love for all has increased and continues to. It’s a love far beyond our mortal self-generated love. Fear keeps us bound from the Truth, while cultivating a relationship with the Spirit of Truth, who guides us into truth, sets us free. There is no fear in perfect love. The image of God is no image for he is always beyond creation, but what we can have that is true is a personal understanding of the nature of his divine love; which is the summation of all his characteristics. He is always far beyond us and our “knowing”, yet we can know of his love; because it is always extended toward us. And through this love, there is much that we can learn. So it is simple and yet very deep, vast and rich at the same time. When we are in a living faith in this divine love because it has become more real than anything else we know, we act according to this love as we able given our awareness, then there is nothing to fear. Nor would we want to do anything counter to this divine love. When we’ve not yet come to this level of knowing all kinds of things can create fear. But fear is generated from the self-determined consciousness, not God, or the truth. He is perfect love, thus of no fear. With this divine love is truth, so when we have fear we also lack truth. Thus, why people have been given access to the Spirt of Truth to teach them all things. And if they are desiring to truly following him, he is the perfect guide in all areas helping them from where they are at in their level of spiritual maturity. Thanks for sharing . . . also giving us a suggested direction. My mother pass-over to the spirit world on the 30 June 2015. I never cried as though she was gone forever – I understood clearly that her mandate/purpose in this time-space continuum was accomplished and that her spirit was to return from where it came – The Oneness – GOD. I always talk to her – even when I am praying – that connection still needs my mother to be around but alas she is gone . . . Maybe watching or maybe busy preparing for another assignment in this great big immeasurable universe. Blessings. Thanks for sharing Alec. This understanding of which you reiterated gives an amazing peace throughout the experience of someone’s transition; particularly if we share a close connection to him/her. Love is not deterred, it turns not from it’s path, for it’s foundation is sure. If you’ll allow me sister with this comment, I would like to just correct and edify concerning a particular thing a man was saying on this post that I see showing up in my email. Though I know it’s gone cause he was harassing on this post. He kept saying your brother is not in another realm, he is just dead, as if there is no consciousness or anything going on in his soul. But when you examine the story in 1 Samuel 28 that I mentioned earlier in this post concerning Saul going through the woman with a familiar spirit of Endor to divine unto Samuel from another realm. He did end up talking to Samuels spirit literally and Samuel said why have you troubled me in bringing me up, he said that Saul was Gods enemy and so he should know Samuel couldn’t help him and he prophesied he would die the next day with his sons, and be where Samuel was. That’s something for anyone to think about. If Samuel was in another realm of God who was a righteous and mighty prophet, and he’s telling Saul who is wicked and Gods enemy that Saul is going to be where he is, then obviously to me wether righteous or wicked in this earth, people are in another realm. Just wanted to clarify and edify on this subject. Peace. Jose, Thanks for sharing. I think to know that God creates nothing or anyone in vain is important. Everyone and everything is serving a purpose; which in the end works for the highest good of all. I think for us and in part what this story reflects, as well as other things, is that our heart or motive is important. Saul seems to be operating with poor intentions and thus the response he received. Jesus in his teachings certainly addressed the importance of the state of our heart in what we do. We all fall short in our actions for we don’t know as we ought, but our heart can be desiring to growing the wisdom and love of our loving Creator. Though we can only see the “fallen” side of someone God’s power is endless in what he can do in and with a soul. We all have error, and we all need the same thing, his divine governance, which is ironically our freedom. I say this because in the confines of a self-determined consciousness, which we are until we are truly one with God, no one is righteous and thus we see our need for God’s righteousness (divine judgment, governance, which equates to divine love). Some of us have understood this need and that it is our Creator’s plan and gift to give us his righteousness (as Jesus Christ revealed). So we have this assured hope that we will be righteous by his will and doing, thus we live in that faith. For God to be all in all, means that we are all governed by his perfect rightness and goodness. This is true that our righteousness is only of God in Christ Jesus and not our own and that all principalities, powers, and mankind are created by him and for him for a purpose in God. Even according to Gods foreknowledge and determined counsel was it ordained that they would crucify Christ for mankind’s benefit and that his precious blood would take away the sin of the world, and that all would be taught by God having one teacher Christ Jesus, with boldness and access to this faith and to enter into the holiest place by the blood of the lamb. For God works all things after the counsel of his own will so this is Gods doing and his hand and not our own, as brother Paul said in Romans 8; the creature, being mankind, was made subject unto vanity,not willingly by their own will, but by reason of God, who has subjected the same in hope. We wait for the manifestation of the sons of God to be delivered from corruption into the glorious liberty of the children of God . For we have the hope of our calling to the obtaining of the glory of our Lord Jesus Christ, that this vile body will be fashioned like to his glorious body, that he is able to subdue all things. We are children of God and it does not yet appear what we shall be, but when he appears we shall be like him for we shall see him as he is, and every man that has this hope purifies himself even as he is pure. As psalm 147 says, God’s wisdom and understanding is infinite and of great power is our Lord. He is the highest of all. Praise be to him. He loves you thru everyone you know.